The imagery is of an armed Roman or Israelite soldier, prepared for battle. A typical armed soldier wore a breastplate made of bronze or chain mail. It covered the vital organs, namely, the heart, and was fitted with loops or buckles that attached it to a thick belt. If the belt was loosened, the breastplate slipped right off. We are instructed to “put on” this armor, which implies that we do not automatically wear it all the time. Putting on the armor of God requires a decision on our part. To put on the breastplate of righteousness, we must first have the belt of truth firmly in place. Without truth, our righteousness will be based upon our own attempts to impress God. This leads to legalism or self-condemnation (Romans 8:1). We choose instead to acknowledge that, apart from Him, we can do nothing (John 15:5). We see ourselves as “in Christ” and that, regardless of our failures, His righteousness has been credited to our account. As we wear Christ’s breastplate of righteousness, we begin to develop a purity of heart that translates into actions. Wearing this breastplate creates a lifestyle of putting into practice what we believe in our hearts. As our lives become conformed to the image of Christ (Romans 8:29), our choices become more righteous, and these godly choices also protect us from further temptation and deception (Proverbs 8:20; Psalm 23:3). When armor is abused or worn incorrectly, it can malfunction. Likewise, there are several factors that can interfere with the effectiveness of our spiritual breastplate. Carelessness (1 Peter 5:8), unbelief (Hebrews 3:12), abusing grace (Romans 6:1–2), or disobedience (1 John 3:4; Hebrews 4:6) can hinder our ability to stand firm and defeat the enemy in our lives. When we tolerate sin, refuse to forgive (2 Corinthians 2:10–11), rely on personal righteousness (Titus 3:5), or allow earthly concerns to crowd out time for an intimate relationship with God, we, in effect, take off the breastplate of righteousness, minimizing its power to protect us. 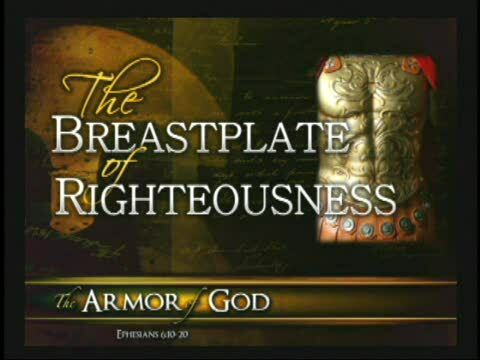 We need our breastplate of righteousness in place in order to gain the victory specified in 2 Corinthians 10:15: “We are destroying speculations and every lofty thing raised up against the knowledge of God and we are taking every thought captive to the obedience of Christ.” When we quickly reject heretical ideas, idolatry, and the “counsel of the ungodly” (Psalm 1:1) and instead “keep our eyes on Jesus, the author and finisher of our faith” (Hebrews 12:2), we keep our breastplate securely fastened. Proverbs 4:23 says, “Guard your heart above all else, for it is the source of life. Please remember to read your study guide book from each study. So your heart is the seat of your life. The source! And what the physical heart is to your physical life, the spiritual heart is to your spiritual life. Glory to God! These are so encouraging to read. The Bible tells us to guard our hearts. Righteousness literally means justice- the equality of being upright, fulfilling the expectations set in a relationship. In our case as believers, this relationship is with God Himself. Righteousness, then, is upright living that aligns with God’s expectations. To wear the breastplate of righteousness properly, we need to switch things up a bit. Righteousness is in you, now it needs to be on you! I know it doesn’t often feel this way, but your new self is the righteous nature and the very holiness of God (imputed righteousness). That’s the real you. At your core, you are pulsing with the new life of Christ. And guess what? “The fruit of the light results in all goodness, righteousness, and truth” (Ephesians 5:9). He’s just amazing that way. So if wearing the breastplate-if all this “putting off” and “putting on” is proving particularly difficult lately-realize you’re not alone. But realize something else too; you have an invisible partner every time you jump into battle and tug that breastplate over your heart. God is doing something this very minute to help you do what you otherwise could not. He is renewing your mind, realigning your passions and attitudes, and giving you strength to live in a way that is pleasing to Him and a blessing to others. What a perfect alternative to practice. Meditating on God’s Word, internalizing its principles, and then implementing them in your actions is what supports the work of God’s Spirit in renewing your soul. In growing you. In changing your taste buds. In adapting what you find most appetizing and fulfilling. If you only skim Scripture while you’re half asleep or as an afterthought between appointments, letting it go in one ear and coming out the other with little thought or determined interest, you’ll never receive the full benefits of what the living, active Word of God is prepared to produce in your life. As we’ll learn a bit later in this Bible study, God’s Word is the Spirit’s “sword.” It’s not only what He uses to grow you up and save your soul, but also to combat the enemy’s attempts to do damage to you. Please read more on pages 86-90. You’ll get the big picture! As we come to the end of this beautiful week of study in the unchanging Word of our Almighty God, make a battle plan for wearing your breastplate. “Be imitators of God . . . and walk in love, just as Christ also loved you and gave Himself up for us” (Ephesians 5:1-2). The old man is dead and gone. You are no longer a slave to the flesh, to sin, to unrighteousness. You have been set free in Jesus and given new life. Enemies: Sin, Deception, revenge, schemes, corruption, hatred. Charge: Love, Bless, Do good, pray. That is how you overcome evil with good. It’s the most revolutionary force in the world! 10). When we don’t have an intimate relationship with God how do this effect us?